Are you ready to return to that magical land of mountains awash with rocks and rainforest; steep passes, plunging waterfalls and patch-worked plains; green and glowing with magnificent sunsets? So I don’t have to tell you again that the semi-circular Scenic Rim runs along the rugged ranges of the border between Queensland and New South Wales about an hour west of Australia’s far better known east coast hotspots like Byron Bay, the Gold Coast and Surfers Paradise. It’s not that far from Brisbane, either. And I certainly wouldn’t dream of repeating myself to say it’s quite different to ANY of these – and most other places in Australia as well! 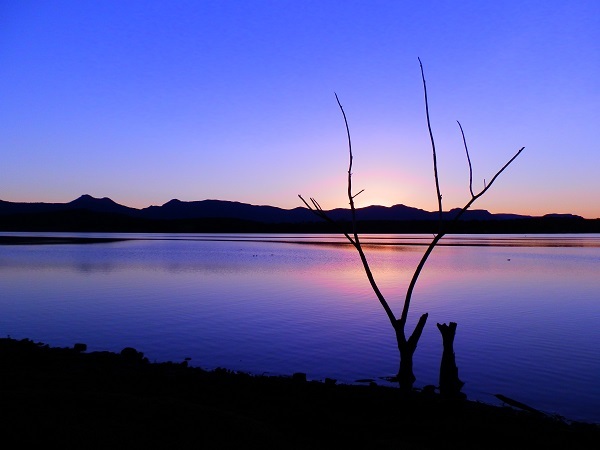 SO … if you haven’t already put the Scenic Rim on your ‘MUST SEE’ list, do it NOW! … Oh! You want MORE random adventures? 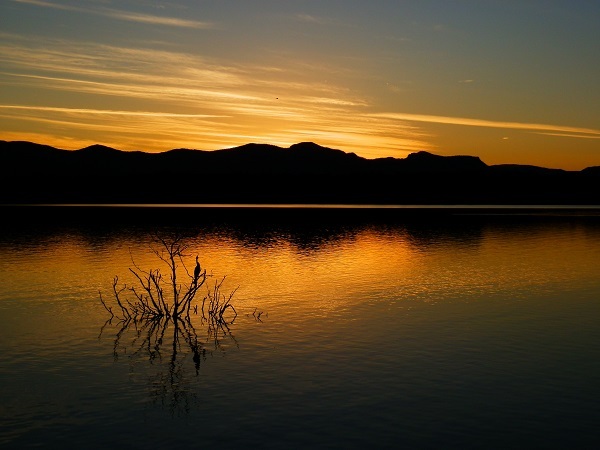 I’d spent SO much time using Lake Moogerah as a mere backdrop to (all modesty aside) stunning sunrise (see Part One), lovely landscape (see Flickr) and superb sunset (see below) photos, I hadn’t seen it as an attraction in its own right. Despite its 8.27 km² surface area! 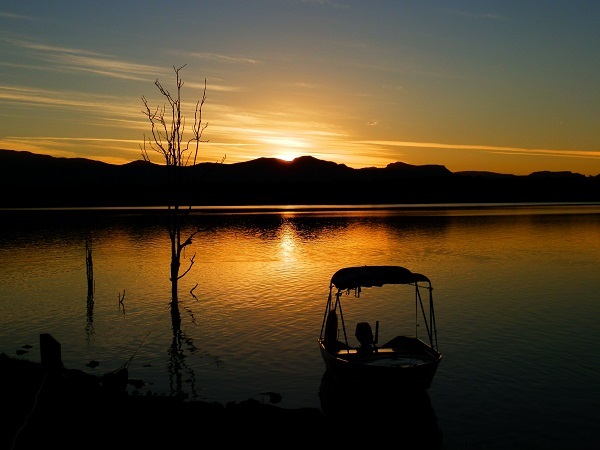 So on our last day in the Scenic Rim Region, we hired a boat – the same one shamelessly used as a sunset shot prop – from the Lake Moogerah Caravan Park and spent four fun-filled hours exploring the lake. Reversing the usual vista of the lake from the shore was a master-stroke of staggering genius for both the birdo (Pilchard) and wannabe-photographer (Red) AND a cheap half-day out at only $60! If possible, the landscape – perfect but for the pall of smoke from yet another controlled burn-off – was even MORE sensational than from the shore. Signs on the shoreline show the height reached by the dam during the rain events and flooding of January, 2011 which also flooded Brisbane. Cruising past the mass concrete double curvature arch dam wall with an ungated spillway that would have been several metres below us during those floods made what we’d seen on TV more real. 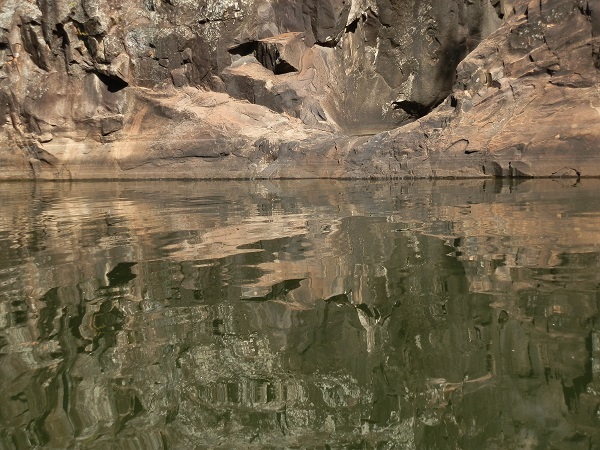 As we cruised Lake Moogerah’s long and varied shoreline, the four hours we’d hired the tinnie for disappeared in a flash! Imagine how much MORE time we’d have needed if we’d actually gone fishing instead of indulging in a birding/photographic frenzy?!? Warnings about unmarked tracks, rockfalls and fitness requirements deterred us from scaling Mt Barney’s 1300+ metre high twin summits. Even the ‘safer’ walks around Mt Barney’s base were still riddled with hazards. That’s if we could even get there without a 4WD! 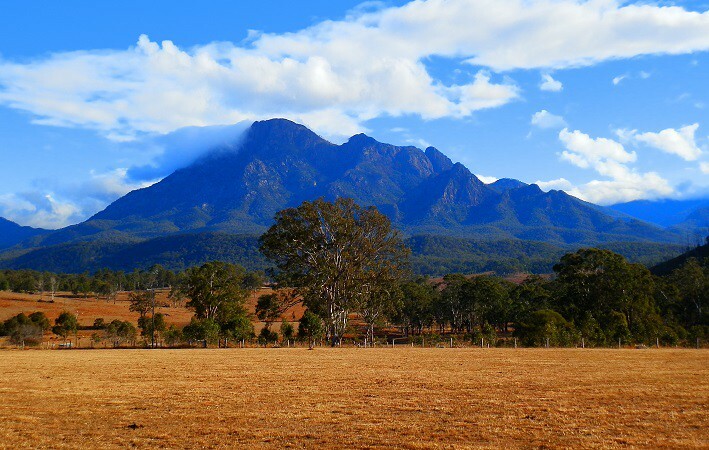 But the imposing magnificence of the Mt Barney Peaks dominating the landscape en route from NSW town Woodenbong to Queensland town Rathdowney had cast their spell. And who knew when – or whether – we’d pass this way again? 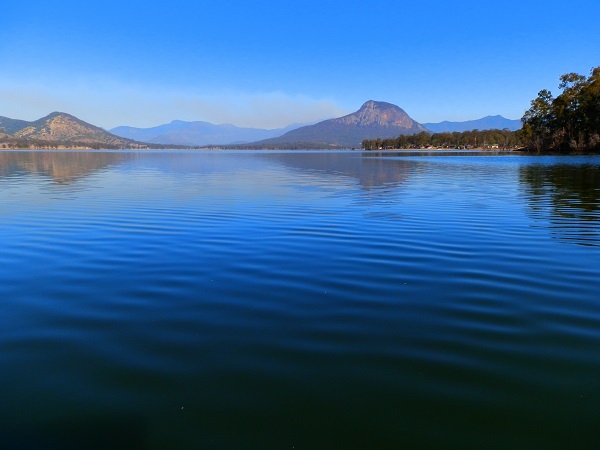 So although a burn-off on one of the mountain’s flanks was scheduled on the day of our Mt Barney hike, the forecast suggested the prevailing winds would blow the smoke away. And heavy hiking boots would make short work of the washaways and moderate to steep gradients of the 7.4 km return Lower Portals trail. We weren’t in any hurry! A couple of kilometres, some magnificent forest and a kookaburra later, the wind changed direction and the valleys filled with a blue, smoky haze. Not just ‘smoky’, but ACTUAL SMOKE! I could see a long session at the Lake Moogerah campground laundry in my future – but in the meantime, it enhanced my photos superbly! 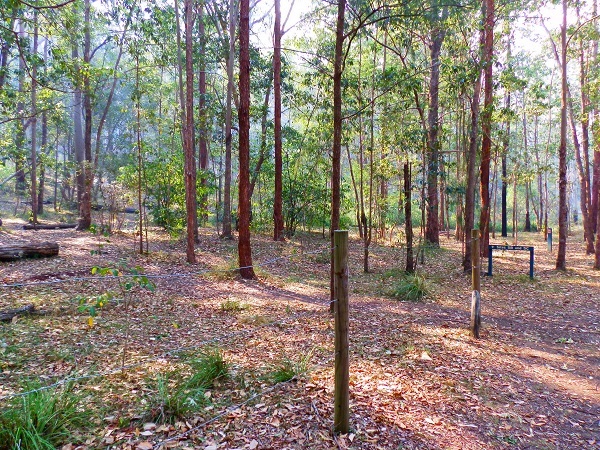 The campground at the track’s junction with Mt Barney Creek was the first I’d ever been to accessible only by foot, but its location beside the rocky gorges of the Lower Portals almost made me wish I’d carried my body weight in camping gear in so I could stay there. The most hazardous part of the hike, however, wasn’t the road in; thickening smoke; rocks in the creek; or challenging track conditions – but passing a group of what seemed like dozens of teenage boys addressing each other in the incomprehensible teen-speak of youth, pungent from the sweat and smoke of a 3-day camping trek around Mt Barney’s highlights as they headed back to the trailhead with the mindless dedication of a mass lemming migration. Where’s the hazard, you ask? Well … YOU try maintaining a steady pace – NO puffing or panting! – while climbing an astonishingly steep staircase as you respond (in a normal voice) to the polite greetings of the group and their minders! ALL with a smile on your non-red face! Our first visit to the Scenic Rim and we didn’t even know the Condamine River Valley existed. A week later we’d seen this part of Australia’s longest river system twice! From the New South Wales side, we drove the Lindesay Road, arguably Australia’s worst, from Woodenbong to Queen Mary Falls, then up the range to Carr’s lookout, and (arguably) one of Australia’s finest views across the Condamine Valley. On that trip, we didn’t take the Head Road down into the valley. But from Lake Moogerah, it’s a stunning drive through the valley then up an impossibly steep road to the scenic splendour of Carrs Lookout. There’s nowhere to hide on this narrow, steep and winding road, so hope like hell everyone else has seen the ‘not suitable for caravans’ warning signs!! Tragically, the limitations of our vehicle meant we didn’t experience the 4WD-only Condamine River Road’s 14 creek crossings on the Cambanoora Gorge Circuit. So we took a superb morning tea at the Spring Creek Mountain Café just below Carrs Lookout as partial compensation for our disappointment. At 468 metres above sea level, Mt French isn’t very high by either Australian OR Scenic Rim standards – and it’s SO off the radar by world standards! It’s the lowest of the four peaks that make up the Moogerah Peaks National Park. And it’s only a short drive to the top from Central Scenic Rim town Boonah! But Mt French’s Logan’s Lookout is one of the highest points in the Fassifern Valley, thus giving great view over the much higher ranges to the south-west on the NSW/Queensland border. But the REAL attraction is the vertical fissuring which apparently makes this an internationally renowned ‘crack climbing crag’ – or so I am reliably informed. On our late afternoon visit, there weren’t any climbers visible on Frog Buttress, the rocky outcrop at Mt French’s northern end where the crack rock climbers congregate. I guess once you’ve cracked the rock stacks, there’s nothing for it but to retreat to the Frog Buttress Campground. And with a name like that AND a dose of cool Scenic Public Toilet, who wouldn’t want to stay there? Along with the crack-rock-climber-campers communing with nature via the enticing blend of electro-hip-hop-funky-c-rap spewing at a million decibels (give or take) from their appalling car sound system?? Perhaps crack-rock-climbing wasn’t the only ‘crack’ on offer! Dang! Where DID I put those ear plugs??!! Amongst the detritus of the camera-battery-flattening array of Lake Moogerah shots my snap-happy shutter button finger (and I) took hour after punishing hour, there are a few sunset shots worth keeping. Weirdly, all the good ones have props! 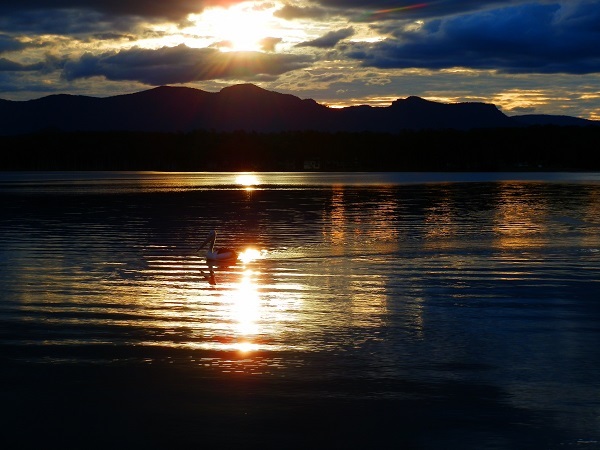 Taking a sunset stroll along Lake Moogerah’s shoreline became a habit on the nights with no rain, with one added bonus over the sunrise strolls – no one saw me in my pyjamas*! Where is the Scenic Rim? MORE photos on Flickr HERE! NEXT Post: Tour the Yorke Peninsula via its BEST Scenic Loos! ANOTHER amazing Aussie destination to add to my travel list Red. Thanks! It’s TOO easy (even for me) to take good shots when there’s scenery like THIS on offer, Ladyfi! 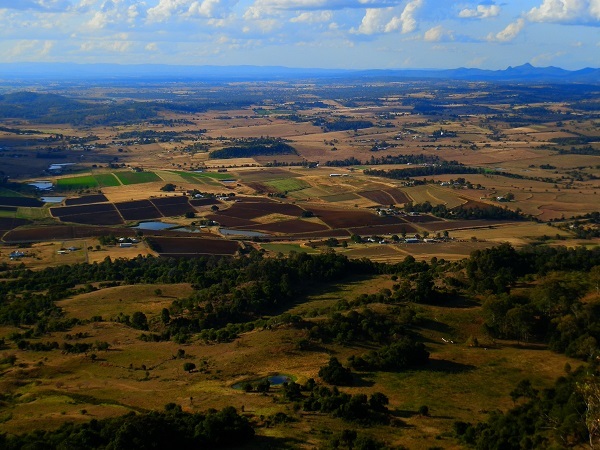 As everyone else said above, these are stunning photos of the scenic rim! I also very much enjoy your writing! It makes me laugh! 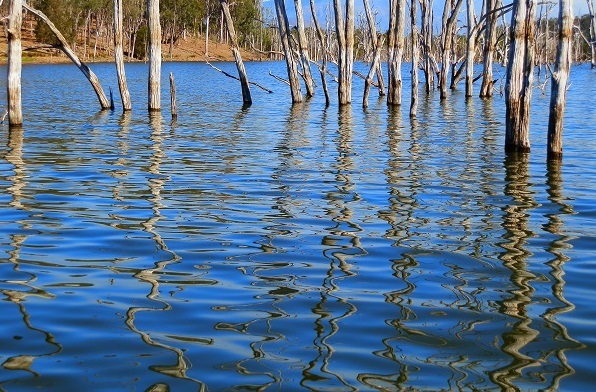 Aww, Lake Moogerah – great pic! 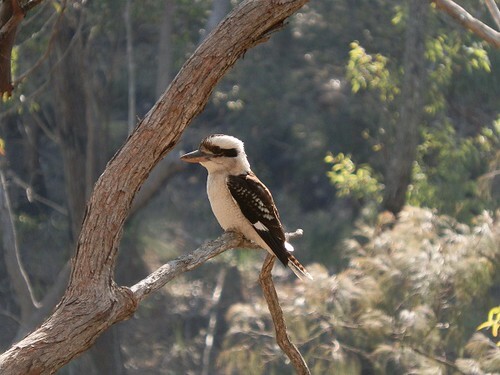 And the kookaburra… The ones in our zoo… so sad. 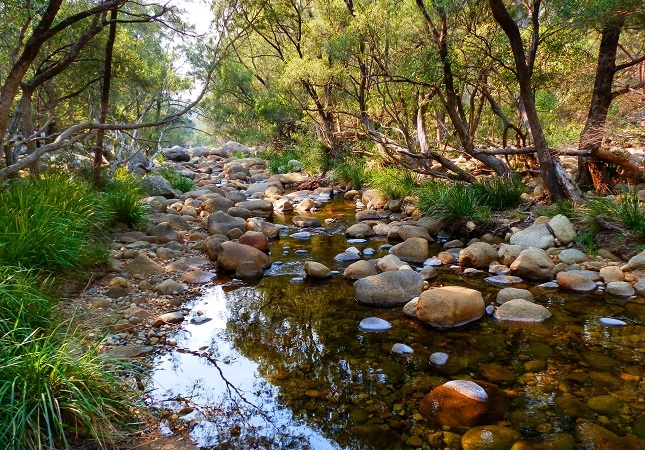 Beautiful pic of Mt Barney Creek, too. Totally pale taken, I reckon. The view from Mt French really looks European-like. Aka boring to me 😉 But really beautiful sunset shots! These are naturally beautiful landscapes. You’r right, Jane – they’re magnificent, but I’m not sure if I have done them justice!! Thank you Christie! I try to ‘channel’ whatever place I’m writing about and re-live the experiences. I’m glad it’s translated into how you read it! Maybe you’ll come to visit one day?? I’ve had many of my students study in Australia, so maybe I should come too, sometime. I think my husband would need a first class airline ticket though–he couldn’t take such a long plane ride in coach! You know you do some of the best posts here in blogland, I always love coming here and seeing what you have on offer, this post did not let me down. Thank you so much, Jo-Anne! You are SO good for my ego … and I hope I’m inspiring your future travels! Mt Barney creek with all those smooth rocks is my favourite here. I could sit there for hours listening to the water babbling along. Even without the long walk it was easy to take a LONG ‘photo break’ (read: REST!) at the creek, River! The boulders seemed to have been perfectly arrayed to make the best possible photo! If I’d taken camping gear, I WOULD have spent the rest of the afternoon there! Thanks so much for that post. I’ve visited the area a couple of times and haven’t even started to tap its beauty spots. I now know where to head next time! I wouldn’t have thought about the boat trip on the dam but I won’t forget about it. I don’t think I’ve seen everything this region has to offer either, Pauline! And I’m sure the experience is different depending on the season, too! The boat trip was born of pure laziness – we wanted to spend the day exploring, but we had no energy to go further afield!! The pose of the kookaburra looks so smart… I love to see Australian wild birds very much. When I find a kookaburra in Scenic Rim, I’ll make sure not to get so excited that I miss cliff edges!! That kookaburra was posing just for me, Kozue!! And he was right next to the path so I wasn’t in any danger of falling!! 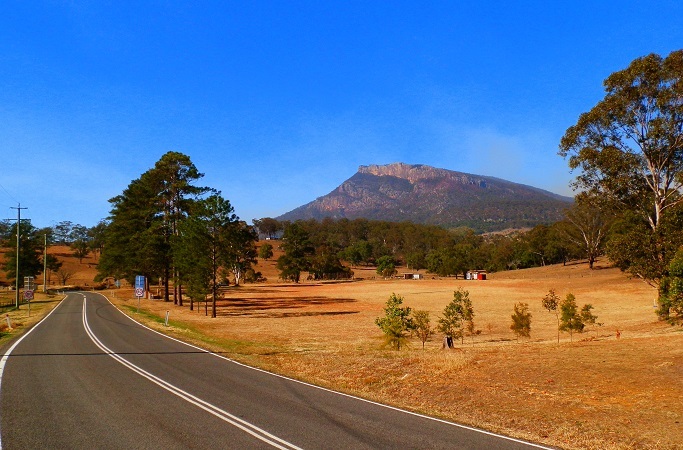 I hope you make it to the Scenic Rim one day – it’s AWESOME! Sunrises always seem a little angry to me, whereas sunsets have a calming effect as the day slides to night. 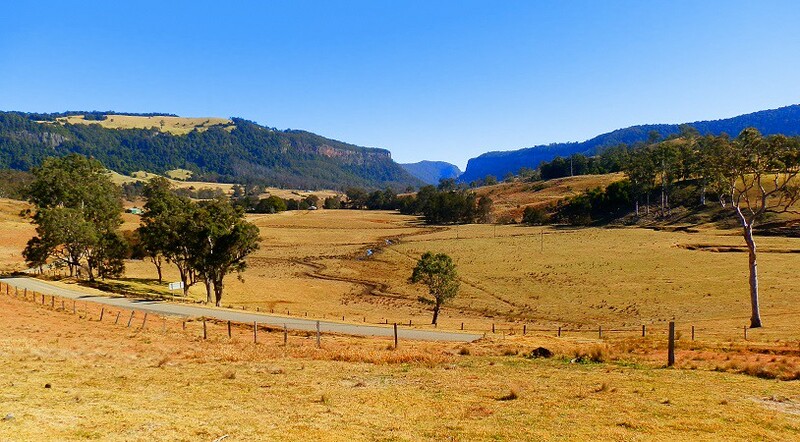 Love the Fassifern Valley photo and all are good photos.